I know, I know. She’s posting a fruitcake recipe? Trust me, I’ve heard all the jokes. Door stop, pin cushion, sand bags, you name it. The words “world’s best” and fruitcake are generally not seen as compatible with one another. After all, it’s probably one of the most ridiculed baked goods in existence. You know those ones that are sold in the stores or sent as gifts at this time of the year? I despise those ones too. They’re dry (in a this-must-have-been-baked-several-months-ago kind of way) and filled with those scary neon, candied fruit bits. I’m not even sure if they are actually fruit. But….this recipe, which I’m sharing today, is not your average fruitcake recipe. It’s actually my mom’s recipe, which she has tweaked and perfected over the years, and makes every single year during the holidays. At one point, my mom and godmother even attempted a very short-lived fruitcake business–that is until they realized that it is probably one of those expensive desserts to make of all time (dried fruit and booze!) and they had to charge a fortune to break even. Regardless, Christmas is just not the same without this fruitcake. In fact, British desserts are sort of the go-to at our house during this time of year (my dad’s English, so its not completely random). We even have homemade year-old figgy pudding, which is flamed right before we serve it, on Christmas evening. Anyway, back to the recipe. This fruitcake is al about the dried fruit. And there is a ton of it in there. Dried unsweetened apricots, cherries, figs, prunes, raisins, pears, peaches, apples–all of which gets soaked in dark rum the day before baking. Have I mentioned that this cake is boozy? Because it is. The resulting fruitcake is so incredibly moist and is perfectly balanced in sweetness. It really does taste like Christmas. And…here comes the fun part. To store it, you wrap it in sherry or triple sec soaked cheesecloth! Yes, lots and lots of booze. Brush it with a simple apricot glaze and serve it sliced with a little bit of butter. 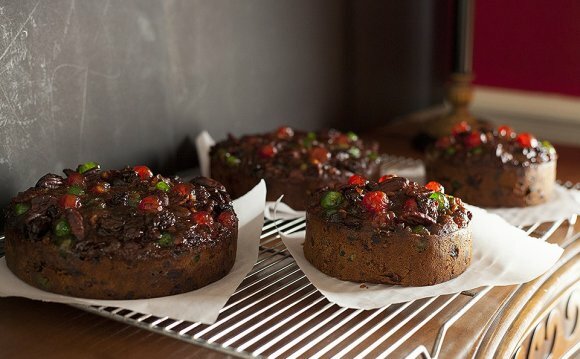 You’ll definitely become a fruitcake convert for life! Chop all of the dried fruit and place in a large mixing bowl. Add the dark rum, cover with plastic wrap, and allow fruit to soak overnight in a cool place.